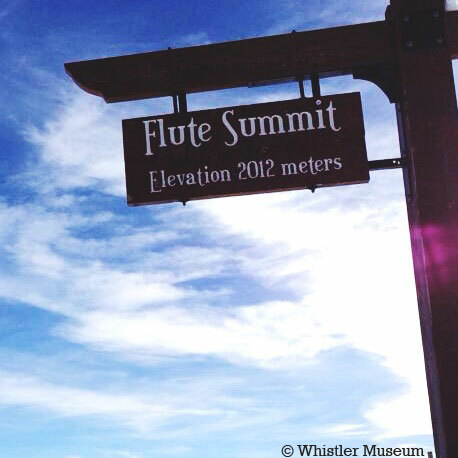 Ever wonder how Flute Summit got its name? Well, Piccolo, Flute and Oboe, adopted in 1965, refer to three secondary summits extending southeast from Whistler Mountain. The lowest summit was named Oboe in reference to the instrument with the lowest pitch of the three, the middle summit was named Flute in reference to the instrument with the middle pitch, and of course, the highest summit was named Piccolo in reference to the instrument with the highest pitch. For other interesting and quick facts, follow the museum on Instagram at http://instagram.com/whistlermuseum. This entry was posted in Environment and tagged Flute, Quick Facts, Whistler. Bookmark the permalink.